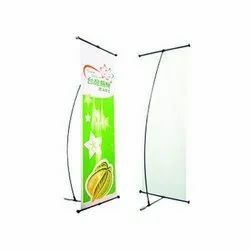 Providing you the best range of l shape banner stand and x banner stand with effective & timely delivery. We are the manufacture of the L Shape Banner Stand and we can deliver the product in very competitive price. We design and offer wide range of X Banner Stand which are attractive in designs and catches the attention of the viewers. As per the specification provided by the clients we imprint the information on the banners and offer them in various shapes, styles and sizes. 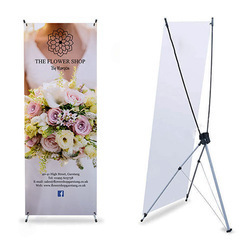 Our wide gamut of telescoping (adjustable) banner stands comprises of outdoor banner stands, double sided banner stands, hanging banner stands, motorized banner stands, special banner stands, Roll Up Banner Stand and many other as specified by the clients.